A hazardous waste is any waste or combination of wastes that poses a substantial danger, now or in the future, to human, plant or animal life and which therefore cannot be handled or disposed of without special precautions. The Hazards and Disasters can be classified into four categories viz., Natural events, Technological events, Man-made events and Region-wise events. The adverse impacts caused due to the indiscriminate disposal of Hazardous Wastes (HWs) come under the category of Environmental Disasters. For example, in 1982, 2242 residents are evacuated after dioxin is found in soil in Missouri, U.S.A. In 1996-97, 265354 tonnes of soil and other dioxin-contaminated material from Times Beach (Missouri, U.S.A) and 26 other sites in eastern Missouri had been incinerated. Release of Methyl Isocyanate (MIC) gas in Bhopal (1984) caused a severe disaster in India. So there is a growing concern all over the world for the safe disposal of hazardous waste generated from anthropogenic sources. Identification of Hazardous Waste Generation: Identifying the HW generating industries is the first step. The HWs are classified under 18 categories and this information may be used to screen the wastes generated and classifying them as HWs. However there are few observations that- there is a probability of occurrence of wastes in more than one category; and this classification system does not give any information to understand the toxic characteristics of HW. Few suggestions are also given to improve the classification system. The data available with the State Industrial Development Corporation (IDC), District Industries Centre (DIC), State Pollution Control Boards etc. may be utilized to identify the industries with a potential for HW generation. 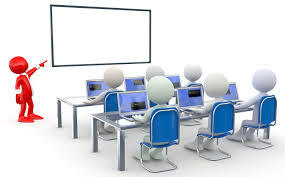 Data Collection: After identifying the HW generating sources, the inventory of the data pertaining to HW generation can be developed by conducting surveys through specially prepared questionnaires to each of the identified sources. This should be followed by field visits for data verification. It is essential that, the data that is obtained from the above options is verified from secondary data (either published data or available for another industry producing similar products). The HW that is generated from the study region should be characterized. For this purpose, it is advisable that the samples may be collected from the waste generation source and analyzed in the laboratory. Literature data may be used in the absence of primary data. The HWs ar · e quantified based on their individual characteristics. The several options of compatibility of wastes with different characteristics should be studied and segregated. The quantity of HWs will be expressed in terms of each category for disposal (e.g. Recyclable, Incinerable, or Disposable etc). The wastes that are recyclable are used/waste oil, lead wastes, zinc wastes. After quantifying the HW, and assessing the probable area requirements for its treatment, storage and disposal, the sites are to be identified. For this purpose, toposheets and/or remote sensing images of the study region may be used. The sites are to be physically verified in the field and to draw observations pertaining to the four different types of attributes available for ranking the sites. The site with a minimum score out of the available sites for ranking should be chosen as the site for establishing TSDF. Identifying the HW generating industries is the first step. The HWs are classified under 18 categories and this information (Refer Table-1) may be used to screen the wastes generated and classifying them as HWs. However there are few observations that- there is a probability of occurrence of wastes in more than one category; and this classification system does not give any information to understand the toxic characteristics of HW. Few suggestions are also given to improve the classification system. The data available with the State Industrial Development Corporation (IDC), District Industries Centre (DIC), State Pollution Control Boards etc. may be utilized to identify the industries with a potential for HW generation. After identifying the HW generating sources, the inventory of the data pertaining to HW generation can be developed by conducting surveys through specially prepared questionnaires to each of the identified sources. This should be followed by field visits for data verification. It is essential that, the data that is obtained from the above options is verified from secondary data (either published data or available for another industry producing similar products). The HWs ar•e quantified based on their individual characteristics. The several options of compatibility of wastes with different characteristics should be studied and segregated. The quantity of HWs will be expressed in terms of each category for disposal (e.g. Recyclable, Incinerable, or Disposable etc). The wastes that are recyclable are used/waste oil, lead wastes, zinc wastes. After quantifying the HW, and assessing the probable area requirements for its treatment, storage and disposal, the sites are to be identified. For this purpose, toposheets and/or remote sensing images of the study region may be used. The sites are to be physically verified in the field and to draw observations pertaining to the four different types of attributes (viz., Receptor related-, Pathway related-, Waste characteristics related-, and Waste management practices related-) available for ranking the sites. The site with a minimum score out of the available sites for ranking should be chosen as the site for establishing TSDF. The Environmental Impact Assessment (EIA) should be conducted in the site identified in the above step. The impacts from the project should be identified and public acceptance should be obtained for clearing the site for TSDF. The TSDF programme should be implemented at the final designated site. The site should contain adequate provisions for storage, treatment (Stabilization, Incineration etc.) and final disposal. Layouts for collecting the HW from the waste generation sources should be planned. The site should have the laboratory facilities to monitor the function of TSDF from time to time. Landfill is the final disposal option in TSDF. The leachate that has percolated should be treated in Effluent Treatment Plant (ETP) before disposal. Monitoring of ambient environmental qualities and TSDF performance should be done regularly during the postclosure period of landfill (30 years). Treatment when used in connection with an operation involved in hazardous waste management, means any method, technique, or process, including neutralization or incineration, designed to change the physical, chemical, or biological character or composition of a hazardous waste, so as to neutralize such waste or to render such waste less hazardous, safer for transport, amenable for recovery or reuse, amenable for storage, or reduced in volume. Wastes remain after the implementation of waste minimisation must be treated to detoxify and neutralise them. There are large number of treatment technologies available. The principal use of vapour phase activated carbon in the environmental field is for the removal of volatile organic compounds such as hydrocarbons, solvents, toxic gases and organic based odours. In addition, chemically impregnated activated carbons can be used to control certain inorganic pollutants such as hydrogen sulphide, mercury, or radon. When properly applied, the adsorption process will remove pollutants for which it is designed, to virtually non detectable levels. In fact one of the first large- scale uses of activated carbon was in military gas masks where complete contaminant removal is essential. 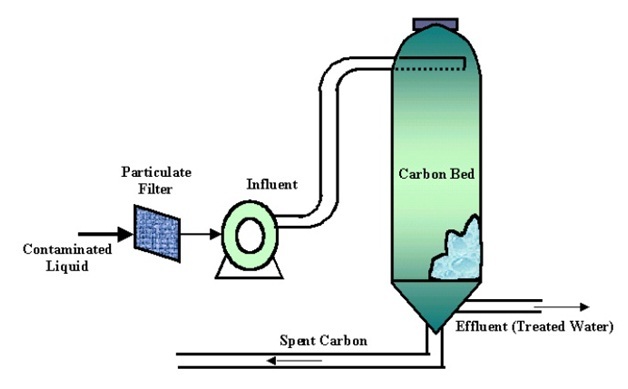 Carbon adsorption is equally effective on single component emissions as well as complex mixtures of pollutants. In the industrial area, the most common applications of activated carbon are for process off-gases, tank vent emissions, work area air purification, and odour control, either within the plant or related to plant exhausts. Additionally, activated carbon is used in the hazardous waste remediation area to treat off-gases from air strippers and from soil vapour extraction remediation projects.